ANTRIM’S quest for promotion remains on course as they held on for a 1-10 to 0-12 win against Wicklow at a wet and windy Corrigan Park on Sunday. Conor McGourty’s opportunist goal on 57 minutes proved crucial although a late Wicklow rally almost saw them take a share of the spoils, which would have been fatal to Antrim’s hopes of taking the step up for next season. With Longford defeating Offaly later in the day, it now comes down to next Sunday in Tullamore when the Saffrons visit the Faithful County knowing victory will see them move to Division Three for next season. The visitors certainly seemed more comfortable with their surroundings early on as they opened brightly and took a 0-6 to 0-1 lead before Conor Murray curled over an inspirational score from the right and this really seemed to settle them down as they finished the half strongly and trailed by one 0-6 to 0-5 – at the interval. It was nip and tuck after the break until McGourty found the score that ultimately decided this contest. Matt Fitzpatrick found himself bearing down on goal from the left and while his low shot that had beaten the goalkeeper was outside the post, McGourty showed a poacher’s instinct to slide in at the back post and turn the ball home to give his side a four point lead. 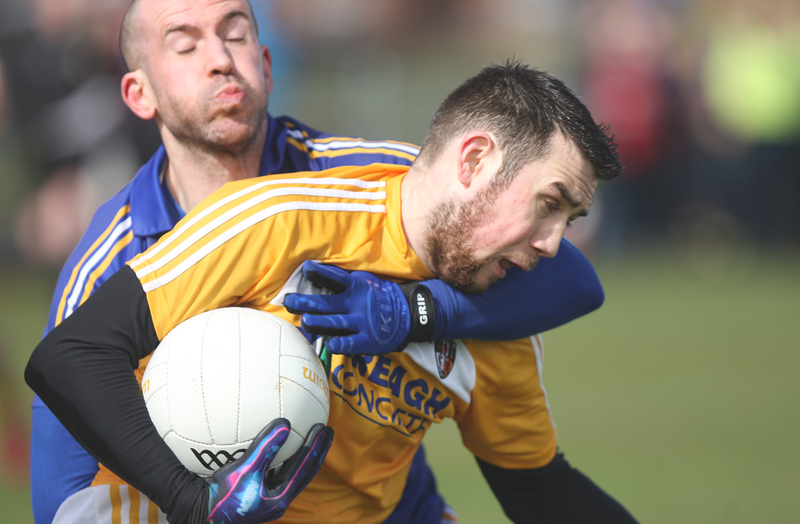 Wicklow refused to wilt and three points made it a nervy finish for Antrim, but they held firm to secure a crucial victory. “It was nerve-wracking OK,” admitted manager, Frank Fitzsimons after. “We seemed to have it in our hands a few times at the end but just didn’t push on. We did get very nervous but we are delighted to take that result. “We thought we looked very nervous at the start and heavy legged. We weren’t going to return for the ball or we were losing ball – I don’t know. But six-one down we were definitely happy with how we came back.